Three big fish. One’s fried. The other two haven’t been flipped yet. 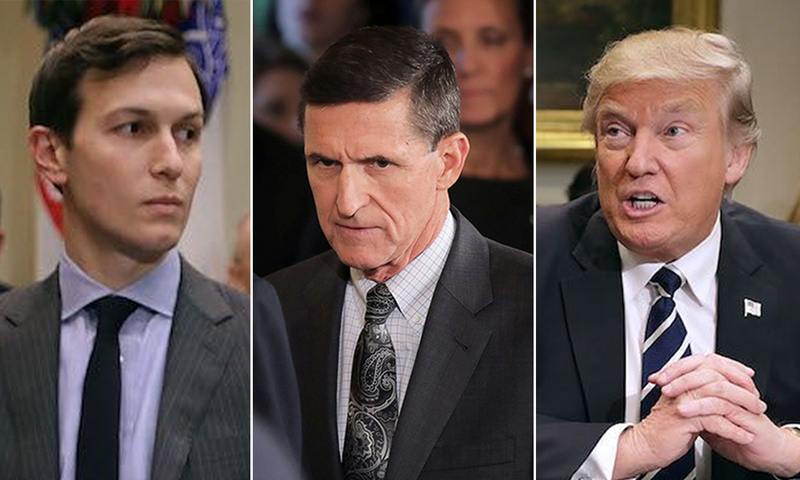 This morning, former Trump national security advisor Michael Flynn plead guilty to lying to the FBI about his efforts with Jared Kushner to torpedo a United Nations Security Council resolution criticizing Israeli settlements. These included lobbying the Russian ambassador to help in this campaign by delaying or cancelling a vote on the matter. Earlier today, I published a new column in Middle East Eye (MEE) which outlined the case against Kushner. In one of the conversations described in court documents, the men discussed an upcoming United Nations Security Council vote on whether to condemn Israel’s building of settlements. At the time, the Obama administration was preparing to allow a Security Council vote on the matter. Mr. Mueller’s investigators have learned through witnesses and documents that Prime Minister Benjamin Netanyahu of Israel asked the Trump transition team to lobby other countries to help Israel, according to two people briefed on the inquiry. Investigators have learned that Mr. Flynn and Mr. Trump’s son-in-law and senior adviser, Jared Kushner, took the lead in those efforts. Mr. Mueller’s team has emails that show Mr. Flynn saying he would work to kill the vote, the people briefed on the matter said. One transition official at the time said Kushner called Flynn to tell him he needed to get every foreign minister or ambassador from a country on the U.N. Security Council to delay or vote against the resolution. Much of this appeared to be coordinated also with Israeli prime minister Benjamin Netanyahu, whose envoys shared their own intelligence about the Obama administration’s lobbying efforts to get member stats [sic] to support the resolution, with the Trump transition team. Use of the term “intelligence” in the above passage implies that the Israelis knew of the Obama administration efforts in support of the resolution through surveillance or communications intercepts. As Eli Lake is a journalist who is exceedingly close to Israeli officials, including intelligence operatives, this strengthens the notion that he is aware surveillance may’ve been involved in this case. In the past, we’ve heard that both the U.S. and Israel bugged each other regarding the negotiations for the P5+1 Iran nuclear deal. This might indicate such efforts were ongoing. Knowledge that Israel was spying on the Obama administration during this period might reflect even more negatively on the Trump machinations against the resolution before he assumed office. It would strengthen the notion that official U.S. interests and Israelis interests were totally at odds in this case. That in turn strengthens the notion of a Logan Act violation (see below). In my MEE piece, I suggested that the activity of the Trump transition team, acting before Trump assumed office, was a violation of the Logan Act. It prohibits U.S. citizens from acting in the name of the U.S., while engaging with a foreign power on behalf of the latter’s interests. In this case, we have perhaps the most explicit violation of the Act in U.S. history, which has never before seen anyone tried or convicted. In other words, the Obama administration’s official position, while not voting for the resolution, was to permit it to be approved by the Security Council. Since this was the official policy of the U.S. government, Trump’s attempt to destroy the chances for the resolution’s passage was a clear Logan violation. No doubt, you will hear Israel apologists argue that the Logan Act claim is specious since the resolution ended up passing anyway. They will claim that the Trump machinations were an abject failure, so its actions should be mitigated by this fact. But Logan doesn’t make allowances for whether a betrayal of U.S. interests is successful or not. The very act of sabotage is itself the offense. It’s clear in this case that Mueller will not use Logan as the direct charge in court to prosecute Flynn or Kushner. As I mentioned, a violation of the Act alone has never led to a conviction. But lying about one’s action pursuant to a Logan Act violation is an eminently prosecutable offense. That’s perjury and a standard federal case. This is what Flynn has confessed to. Next up, without doubt, will be Kushner. He’s next in Mueller’s sites. But unlike Flynn, he can’t cop a plea. If he did so, this would lead directly to Trump, since Kushner without doubt pursued this matter under direct order from Trump. Kushner must protect the big guy. That’s why it’s likely Mueller will actually file charges against Kushner, indict him and prosecute him. Whether he wins the case will determine whether Trump goes down as the next target. The big fish is Trump. That’s who he’s after in the long run. The special counsel aims to hand the Congress a case that is signed, sealed and delivered, ready for impeachment proceedings. Then it will be up to the Republican majority (though if the case lingers after 2018, it might be a Democratic majority) to determine whether to move forward. So 2018 becomes even more critical than it has been until now. Then Democrats will run on essentially one platform: impeach Trump. They will go to the country and ask the American people to give them a mandate to pursue impeachment. At least they will if they’re sensible (which they often aren’t) and want to win. As I wrote in MEE, what’s critical about this entire episode is that U.S. policy toward Israel is at the heart of the matter. Never in the history of the Republic has anyone been convicted for acting on behalf of Israel to sabotage U.S. policy. This is a watershed moment (even though this won’t be the specific, proximate cause of Flynn or Kushner’s ultimate downfall). The Israel Lobby will deny it played any role in this and claim it has nothing to do with these charges. However, it should understand (though given it’s hubris it might refuse to do so) that there are now distinct limits on its power; and that if a politician or Lobby official goes beyond those limits they put themselves into very concrete legal jeopardy. Critics of Israel and its far-right government are always seeking tell-tale signs of the downfall of the Lobby, hoping that this will lead to the downfall of the racist, oppressive policies Israel has pursued for the past decades. There is always a tendency to overemphasize every development and seeing what one wants to see. This is often my criticism of sites like Mondoweiss. Wish fulfillment isn’t the same as fact. The Institute for Public Accuracy has sent a press release to the media on this issue and includes my MEE piece. A question- if now you have an opportunity to transfer data to a European country that might stop Trump from recognizing Jerusalem as Israel’ eternal capital, would you do it? Would you be violating the Logan Act? President elect Trump asked Egyptian President Sisi to delay Sisi’s sponsorship of the UN Resolution. Is Trump also guilty of violating the ancient and barely ever used Logan Act? I like Phil Weiss, but tend to agree with your criticism of him as overly optimistic sometimes. That said, I think you might be falling into that trap here. If Mueller wants widespread support in DC, he would try to get Trump and company on grounds that don’t involve Israel beyond the bare mention necessary to establish that Flynn lied to the FBI. I don’t know much about how the justice system works and won’t even try to predict Mueller’s actions, but politically speaking the last thing I would expect is for Trump’s political opponents to try and get him because he was secretly plotting with the Israeli government and various billionaire donors against Obama. The scandal has focused on alleged corruption involving Russia and the Beltway crowd will do its best to keep it that way. @ Zionauts: Trump wasn’t president when he interfered with U.S. foreign policy to sabotage the UN resolution. He was a private citizen. Hence, yes he violated the Logan Act. And it doesn’t matter whether the Act is ancient or fresh. A violation is a violation. And if Kushner or Trump lie when they characterize what they did involving this matter they’re committing perjury, which is charge far easier to prosecute. You can yawn all you want. But when indictments come in against one or both that’ll wake you up big time! I’m well aware that Trump was a private citizen when he contacted Sisi, which is why I wrote ‘President elect’. Since charging Trump with a violation of the archaic Logan Act would be a ‘case of first impression’ in the nation’s 240 year history, no one can really say what the outcome of the trial would be, other than it would grind the country down to a standstill. If Trump and his cronies conspired with the Russians to subvert the country’s election process, than they should be prosecuted to the fullest extent of the law. @ Zionauts: Trump’s being “president elect” had no bearing oon his official status. He’s still not an official. Second, the Logan Act isn’t “archaic.” If so, the Magna Carta and the Ten Commandments are equally archaic. They just happen to provide the bedrock of western democracy and Judaism. Are they archaic? The Logan Act is the law of the land. And two people have been charged under the Logan Act. But none prosecuted. donald: You’re right. This is a big political tableau. And it’s still under construction. Russia is the biggest part of it. Israel will play a smaller role. But it will play some role & that in itself is important. Thank you Richard for detailing this event. The MSM reported Flynn acknowledged lying to the FBI, but you are the first I have seen to actually write about the specifics of the lie(s): ie: what was the substance of his lies. Thanks again.